IBPS RRB 14192 Office Assistant Recruitment 2017 - RIJADEJA.com - Where Knowledge is NOT Monopoly - OFFICIAL WEBSITE (Gujarat's first Free and No. 1 educational portal) - Government Jobs / Sarkari Naukri in Gujarat, Study Materials for Competitive Exams, Results, Notifications. 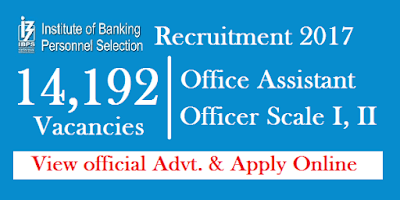 Institute of Banking Personnel Selection (IBPS) published Recruitment Notification for 14192 Office Assistant posts in RRB VI. You can view all details about this recruitment and apply online for IBPS Office Assistant posts 2017 here. The online examination for the next Common Recruitment Process for RRBs (CRP RRBs VI) for recruitment of Group “A”-Officers (Scale-I, II & III) and Group “B”-Office Assistant (Multipurpose) will be conducted by the Institute of Banking Personnel Selection (IBPS) tentatively between September and November 2017. The interviews for recruitment of Group “A”- Officers (Scale-I, II & III) under the same process will be coordinated by the Nodal Regional Rural Banks with the help of NABARD and IBPS in consultation with appropriate authority tentatively in the month of December 2017. RRB/s* (b) Desirable: Working knowledge of Computer. Chartered Accountant: Certified Associate (CA) from Institute of Chartered Accountants of India One Year as a Chartered Accountant. Agricultural Officer: Bachelor’s degree in Agriculture/ Horticulture/ Dairy/ Animal Husbandry/ Forestry/ Veterinary Science/ Agricultural Engineering/ Pisciculture from a recognized university or its equivalent with a minimum of 50% marks in aggregate. Bachelor’s degree in any discipline from a recognized University or its equivalent with a minimum of 50% marks in aggregate. Preference will be given to the candidates having Degree/ Diploma in Banking, Finance, Marketing, Agriculture, Horticulture, Forestry, Animal Husbandry, Veterinary Science, Agricultural Engineering, Pisciculture, Agricultural Marketing and Cooperation, Information Technology, Management, Law, Economics and Accountancy. Each candidate will be required to obtain a minimum score in each test of Online Main examination to be considered to be shortlisted for provisional allotment. Depending on the number of vacancies available in each state, candidates will be shortlisted for provisional allotment. Each candidate will be required to obtain a minimum score in each test of Online Single examination to be considered to be shortlisted for interview. Depending on the number of vacancies available, adequate number of candidates in each category not exceeding three times of the declared vacancies shall be called for interview, subject to availability. Prior to the completion of the interview process, scores obtained in the online main examination will not be shared with the candidates shortlisted for interview.